Aberdeen conducted a survey of over 191 supply chain executives in January 2011 where only 14% of respondents indicated that they had the ability to perform online trading partner collaboration, and 12% have online visibility into supply chain issues and disruptions. 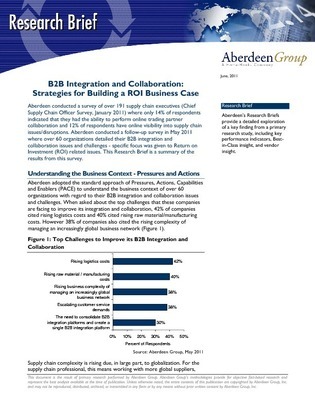 Aberdeen conducted a follow-up survey in May 2011 in which over 60 organizations detailed their B2B integration and collaboration issues and challenges - specific focus was given to return on investment (ROI) related issues. This research excerpt summarizes the findings of this survey.